The 5 Love Languages of Children is a book I've had in my Kindle library for almost 2 years now but I did not finish reading it until May this year. Not because it's not an interesting read, but because it's best applied to older kids. The book expands on those 5 languages in chapters 2 to 6 before going into the application of the theory of love languages in the realm of parenting. Spice's preferred love language of choice is physical touch. She quick to give hugs and knows how to milk them out of even the sternest caregivers. After reading the chapter on physical touch as a love language, I got a better understanding of why she always asks me to "scratch her back" when she's tired and always asks for a hug after I scold or discipline her. Ah-ha moment #2: Scratch my back is code for "love me mummy"
The author emphasizes the importance of nurturing all the 5 love languages in kids and not putting them in a box or labeling. That's good advice and important because love languages can and do change with age and stage for children and they grow up to be more emotionally stable as adults when they learn to give and receive love using all 5 languages. Since reading this book, I've been able to apply the concepts not just to my parenting but also other aspects of my life. I know without a shadow of a doubt that I will be referencing this book at regular intervals forever. There's a reason why The Five Love Languages has been on the New York times bestseller list for 62 weeks. It's because it works and can be life-changing. If you're read this or any of the other adaptations, what did you think of it? "Do We Have To Share Everything?" That was the question Spice asked me Thursday night as I was sorting their laundry. I was in the process of hanging a shirt that the twins' grandma gifted them from Nigeria. The shirt was originally meant for my niece so grandma had just one shirt made. Both girls saw the shirt and asked simultaneously "who's shirt is that?". I replied that it was for both of them and they would have to share. That's when Spice asked that very impactful question above. I was a little taken aback and thankful that reading Emotionally Healthy Twins had made me alert to the girls' requests for more individuality. I asked Spice "Don't you like to share your clothes with your sister?" and she replied "No". Twenty minutes later, after the girls had finished with their bath, I asked Spice the same question again and she still replied no. I needed to be sure so I asked her the following (Friday) night and she once more replied "No". She definitely wanted HER own clothes. Luckily for us, when we redesigned the closet in the girls' room, we did it with the expectation that sooner or later they would want to have individual sides. So I got all their play clothes out of the closet and two by two, we sorted them into Sugar's side and Spice's side. The girls were very proud to do the hanging all by themselves and this morning, they got to go to their side of the closet and pick out what they wanted to wear. Even though I still manage to forget to not buy them the same outfits, (don't y'all love a nicely complicated almost double negative?!) the girls are rarely dressed alike because they always choose different outfits daily and even bargain and trade clothes with each other. If they continue this way, that's one less battle I won't have to mediate when the teen years come. Yay for independence and individuality! 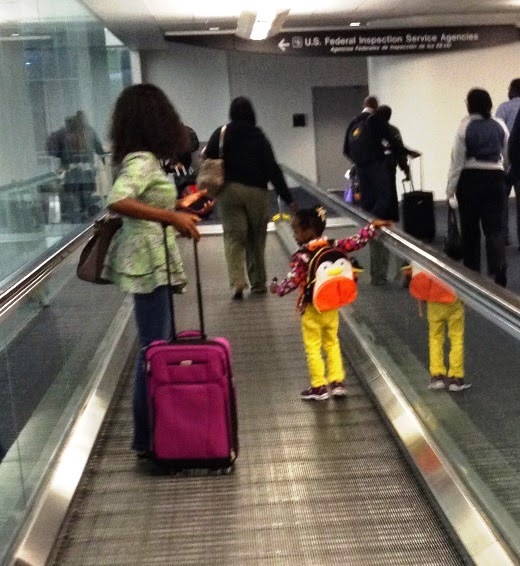 Twin Parenting Lesson 3: They don't have to share everything! Being three and a half, my twins are at that age when they start saying cute / memorable stuff and what kind of a semi-mom-blogger would I be if I didn't come here and share some of those cutiesms with you. Spice: Mama are you ok? Spice: Do you want me to scratch your back? Spice: Do you feel better now? Spice: Mama, put both hands on the wheel! Our recent flights from Calgary to Lagos and back were the twins 13th and 14th flights respectively. Let that sink in for a bit! I've willingly got on airplanes with twin babies/toddlers/preschoolers 14 times in the last 3 years. I'm not crazy, I was motivated by 2 moms who had gone before me. WITH AN INFANT IN TOW! I may have actually yelled this when I asked her "What the?!" She simply brushed my shock aside and said the baby's got to get used to life with the mother he has. Very matter-of-factly. No drama, just fact. I believe I raised an eyebrow and asked why? The husband shrugged and said "Hey, he's got to get with the Smith* lifestyle"
Those two sets of parents probably don't know it but they inspired me to not change my life in a restrictive way because I had young kids who happened to be twins. Instead I try to involve them in the things that I love doing so that we can all enjoy the same activities as a family. And I like to travel so travelling just has to be something they are used to doing. Individual carryons for everyone travelling. I let the kids have their own carryons and it lightened my load considerably. I got both girls the Skip Hop Little Kid Backpacks and we've used them on our last 3 flights. I managed to squeeze in their travel pillows, crayons, coloring books, headphones, drawing board, jigsaw puzzles, cameras and a few snacks. Those bags look small but are quite roomy. Call ahead of time: For the red-eye flight, we got into Ottawa after midnight. I had called the hotel the day before to inform them of our arrival time so the front desk was waiting for us and actually had little goodie bags for the kids as well. Don't count on the plane having individual TV screens: I was banking on the plane entertainment system to keep the girls engrossed. Imagine my shock when I got on board and saw this!! Hey United airline, the 80s called; they want their planes back! Get health necessities: Call travel clinic at least 6 weeks before and make an appointment to get the necessary shots. If you have local knowledge of your destination, use that in making the decision concerning shots. BE INFORMED. The travel clinic recommended 6 shots for going to Nigeria but with my local knowledge and consulting with friends and family who had recently traveled to Nigeria with their kids, I opted for just 2 of the 6 shots. Beg, Bribe, Threaten, Enlist Help: I tried one or more of those methods and had my younger sister on the same flight with us for the Houston-Lagos flights. The girls loved knowing that aunty "Mutan" was just a row away and I definitely enjoyed the extra pair of hands to hold the girls while I attended to other airport matters. Thanks boo! We traveled happy, made good memories and are back home safely. 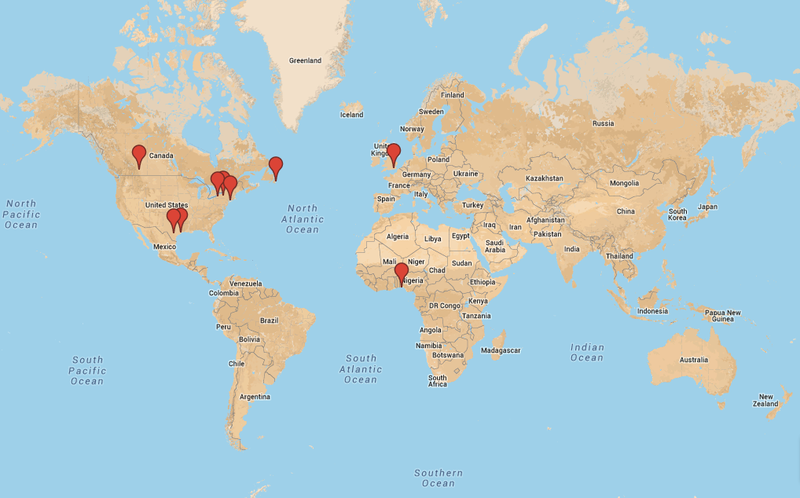 I'm glad to add one more continent to the twins' travel map. Happy Monday peeps!